It’s a binder all about China that I did as a 6th grader in Ms. Johnson’s 5th/6th grade split class (we had class in one of those classroom trailers – we were the “cool/different” class cause we were split apart from all the rest of the 5th and 6th graders – it was like we were on our own island). If you click on the image, it will take you to my flickr page where I talked about stuff in fuller detail. As a graphic designer, I can appreciate looking back and seeing my rather humble beginnings as an artist. It actually cracks me up at how I mispelled, drew really badly, or TRIED to be clever at such a young age. I had a very narrow frame of reference on China (ex. 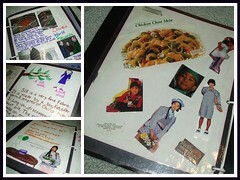 I got all my photos out Benetton Ads), but I remember getting a 99 on my book as a whole. Good times, good times…6th grade. Seems like a lifetime ago. This a good link’s !